Franklin Police are reminding residents, gym goers, park patrons, and moms dropping off kids at daycare not to leave their purses in the car, not even for a minute. Early Thursday evening, officers began receiving reports of multiple vehicle burglaries at both the Royal Oaks Boulevard YMCA and Winstead Hill Park on Columbia Avenue. A total of six vehicles had their windows smashed in, and purses stolen from inside each of the vehicles. The purses were recovered in nearby dumpsters, with only the checkbooks and driver’s licenses missing. Detectives say the M.O is consistent with the work of a group called the Felony Lane Gang, an organized network of criminals who travel the United States and are currently perpetrating their crimes in middle Tennessee. The banking industry coined the “Felony Lane Gang” name, because this group of thieves drive through the lane farthest from the bank teller, while using stolen checks and IDs to fraudulently write and cash checks in bank drive throughs. These suspects use the ‘felony lane’ so that the teller will have more difficulty identifying them. The suspects often use wigs and hats to appear more like the person in the stolen driver’s license while visiting the bank. The Felony Lane Gang is not a gang, but rather a traveling, organized network of criminals originating out of Florida. In most cases, group leaders recruit drug addicts, prostitutes, and transients, renting cars and traveling the U.S., breaking into vehicles. Suspects in this group conduct surveillance in fitness center, park, and daycare parking lots, targeting the vehicles of women who get out of their car without a purse. The suspects then quickly move in, smash the window, and steal the purse that was left behind. Other members of the group then use IDs stolen from some cars to cash checks stolen from others; this often happens shortly after the break-ins. 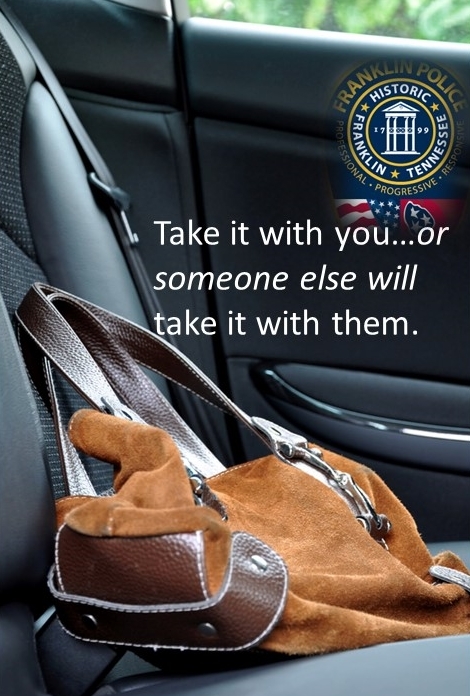 The best way to safeguard yourself from these criminals is to take your purse in wherever you go. Felony Lane Gang criminals routinely watch for women who put their purse into the trunk, wait until the victim walks away, and then break the window to access the trunk release. So, putting your purse in the trunk is not as safe as most people think. If you see multiple people sitting inside of a parked vehicle for longer than would be appropriate at that location, or individuals looking in vehicle windows, contact police immediately. Detectives and Flex Officers have developed several strong leads in the Franklin break-ins, and an aggressive investigation and extra police patrols are underway.